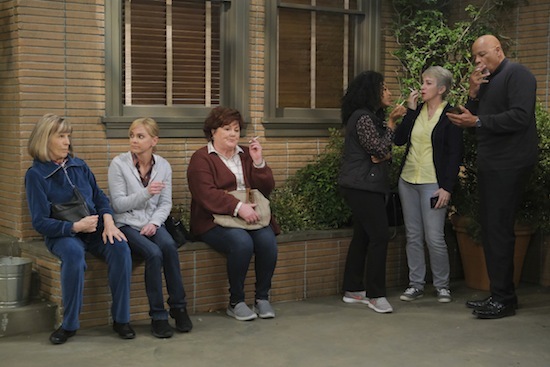 Bonnie (Allison Janney) and Tammy (Kristen Johnston) have a blast from the past when they visit an old foster home on the Thursday, April 25 episode of MOM. MOM’s Christy (Anna Faris) and Tammy (Kristen Johnston) go on a double date on the Thursday, April 18 episode of the CBS comedy. When Christy (Anna Faris) gets sick on the Thursday, April 4 episode of MOM, she has a surprising caretaker: Bonnie (Allison Janney). 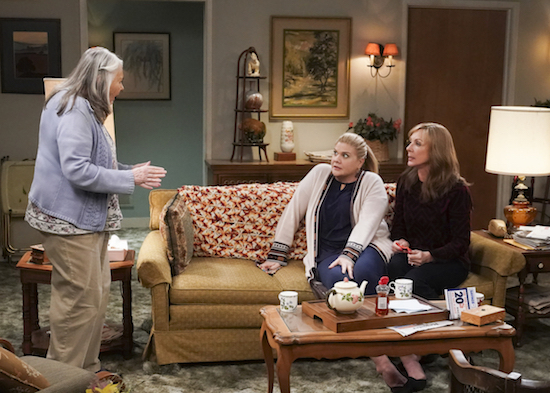 "Soup Town and a Little Blonde Mongoose" -- When Christy gets sick, Bonnie is consumed with an overwhelming urge to mother her, on MOM, Thursday, April 4 (9:01-9:30 PM, ET/PT) on the CBS Television Network. Pictured L to R: Allison Janney as Bonnie and Anna Farris as Christy. Photo: Darren Michaels/Warner Bros. Entertainment Inc. ÃÂ© 2019 WBEI. All rights reserved. 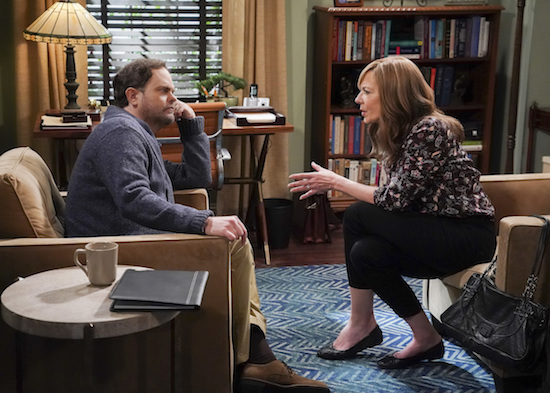 Rainn Wilson guest stars on the Thursday, March 7 episode of MOM as Bonnie’s (Allison Janney) new therapist. Tags: Mom, Mom episode airing March 7, Mom episode airing Thursday March 7, mom photos, mom season 6, Mom season 6 spoilers, mom spoilers, MOM: 'A Dark Closet and Therapy with Horses', MOM: 'A Dark Closet and Therapy with Horses' Photos, Rainn Wilson, Rainn Wilson on Mom, Who plays Bonnie's therapist on Mom? MOM’s Christy (Anna Faris) finds herself in over her head when she attempts to quit smoking on the Thursday, February 21 episode of the CBS comedy. 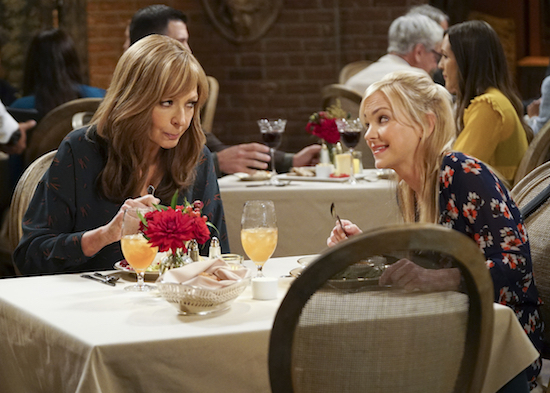 It’s Valentine’s Day on the Thursday, February 14 episode MOM, and when Christy (Anna Faris) is solo, Bonnie (Allison Janney) takes her out for some quality time together. The MOM women rally to help Jill (Jaime Pressly) after her home is broken into. Bradley Whitford is returning to MOM…but is his character a changed man? "Big Floor Pillows and a Ball of Fire" -- Christy and Bonnie are suspicious when Adam's best friend, Mitch (Bradley Whitford), returns, insisting he's a changed man, on MOM, Thursday, Jan. 17 (9:01-9:30 PM, ET/PT) on the CBS Television Network. Pictured L to R: Bradley Whitford as Mitch and Allison Janney as Bonnie. Photo: Darren Michaels/Warner Bros. Entertainment Inc. ÃÂ© 2018 WBEI. All rights reserved. MOM’s Christy (Anna Faris) discovers her newfound smoking habit causes a bit of a speed bump when the women take a trip. "Hacky Sack and a Beautiful Experience" -- Christy's smoking causes problems when the ladies take a road trip. Also, Bonnie offers Adam unsolicited business advice, on MOM, Thursday, Jan. 10 (9:01-9:30 PM, ET/PT) on the CBS Television Network. Pictured L to R: Anna Farris as Christy, Kristen Johnston as Tammy, Jaime Pressly as Jill, Mimi Kennedy as Marjorie and Beth Hall as Wendy. Photo: Darren Michaels/Warner Bros. Entertainment Inc. ÃÂ© 2018 WBEI. All rights reserved. 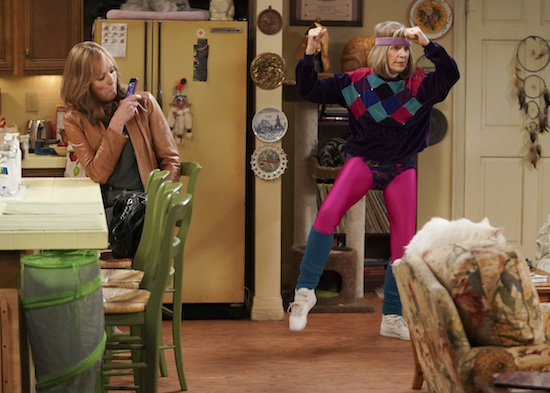 Tags: Mom, Mom episode airing January 10, Mom episode airing Thursday January 10, mom photos, mom spoilers, MOM: 'Hacky Sack and a Beautiful Experience', MOM: 'Hacky Sack and a Beautiful Experience' Photos, When does Mom return in 2019?, When does Mom return? MOM’s Tammy (Kristen Johnston) tries to find a job…and gets way too much support. "Foot Powder and the Barrelworks Pirates" -- Christy's search for the perfect Secret Santa gift leads her to discover Adam has been hiding something from Bonnie. 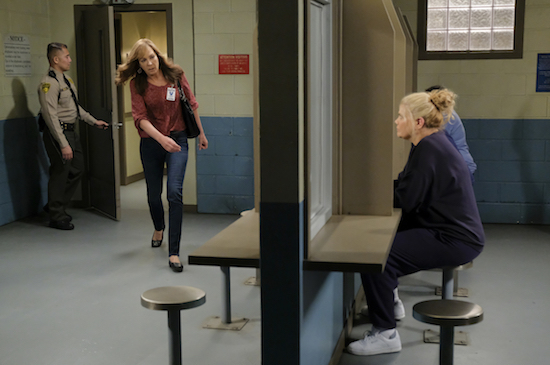 Also, Tammy looks for a job in order to avoid being sent back to prison, on MOM, Thursday, Dec. 13 (9:01-9:30 PM, ET/PT) on the CBS Television Network. 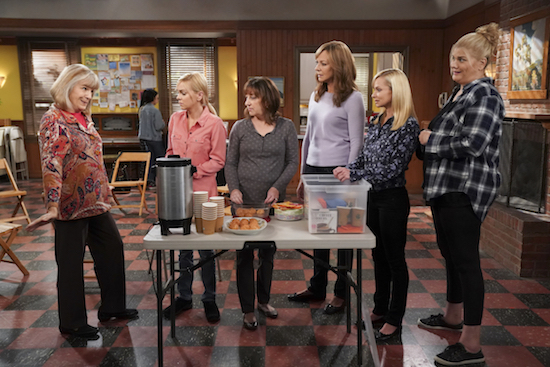 Pictured L to R: Allison Janney as Bonnie, Anna Faris as Christy, Mimi Kennedy as Marjorie, Beth Hall as Wendy, Kristen Johnston as Tammy and Jaime Pressly as Jill. Photo: Darren Michaels/Warner Bros. Entertainment Inc. ÃÂ© 2018 WBEI. All rights reserved. 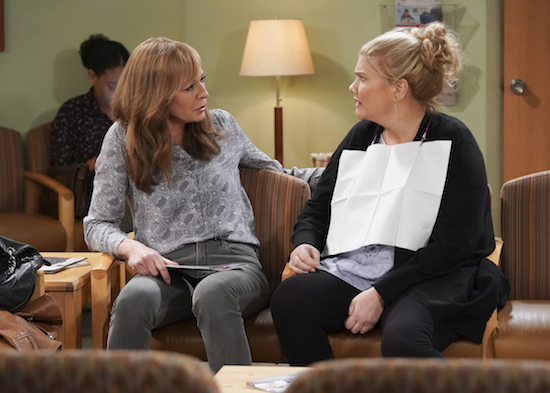 MOM’s Bonnie (Allison Janney) has her hands full on the Thursday, November 29 episode: she has to take care of Tammy (Kristen Johnston) post-oral surgery. Though MOM’s Christy (Anna Faris) has made great strides in mending her relationship with her mother, but her relationship with her daughter, Violet (Sadie Calvano), has been fairly estranged over the past few years. "Jell-O Shots and the Truth about Santa" -- Bonnie pushes Christy to mend her relationship with Violet (Sadie Calvano), and Adam prepares for the grand opening of his bar, on MOM, Thursday, Nov. 15 (9:01-9:30 PM, ET/PT) on the CBS Television Network. Pictured L to R: Anna Faris as Christy, Allison Janney as Bonnie and Sadie Calvano as Violet. Photo: Darren Michaels/Warner Bros. Entertainment Inc. ÃÂ© 2018 WBEI. All rights reserved. MOM is tackling another loss: Majorie’s (Mimi Kennedy) husband passes away, and the ladies rally around their friend to help her through it. Kristen Johnston returns to MOM as Tammy, and this time, she’s getting closer than ever to Bonnie (Allison Janney) and Christy (Anna Faris)—she’s moving in! "Big Sauce and Coconut Water" -- Christy is certain that Bonnie is in over her head when she invites a freshly-paroled Tammy (Kristen Johnston) to stay with them, on MOM, Thursday, date (9:01-9:30 PM, ET/PT) on the CBS Television Network. Pictured L to R: Allison Janney as Bonnie and Kristen Johnston as Tammy. Photo: Darren Michaels/Warner Bros. Entertainment Inc. ÃÂ© 2018 WBEI. All rights reserved.